No, it is not, but it's fairly easy to write your own generator, or better yet use an existing one. Check out: this related question. Also, see David Bau's blog for more information on seeding. NOTE: Despite (or rather, because of) succinctness and apparent elegance, this algorithm is by no means a high-quality one in terms of randomness. Look for e.g. those listed in this answer for better results. You can set seed to be any number, just avoid zero (or any multiple of Math.PI). The elegance of this solution, in my opinion, comes from the lack of any "magic" numbers (besides 10000, which represents about the minimum amount of digits you must throw away to avoid odd patterns - see results with values 10, 100, 1000). Brevity is also nice. First of all, take care to initialize your PRNGs properly. Most of the generators below have no built-in seed generating procedure, but accept one or more 32-bit values as the initial state of the PRNG. Similar seeds (e.g. 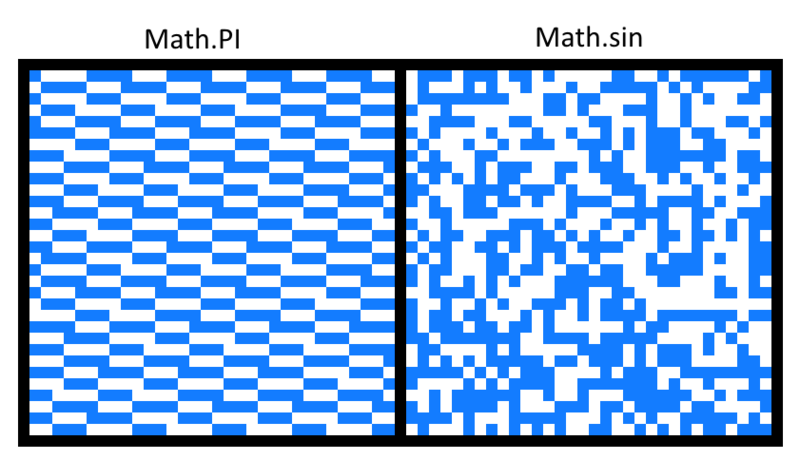 a seed of 1 and 2) can cause correlations in weaker PRNGs, resulting in the output having similar properties (such as randomly generated levels being similar). To avoid this, it is best practice to initialize PRNGs with a well-distributed seed. // Output four 32-bit hashes to provide the seed for sfc32. // Output one 32-bit hash to provide the seed for mulberry32. This is of course functional JS, but it could be objectified. Onward to the goods (the generators). This gem comes from the PractRand random number testing suite, of which it passes without issue. PractRand is purportedly even more stringent than TestU01. sfc32 has a 128-bit state and is also very fast in JS (xoshiro128** is slightly faster, but worse quality). It's probably my PRNG of choice. Mulberry32 is also quite fast and has good quality (author states it passes all tests of gjrand). I would recommend this if you just need a simple but decent PRNG. It has a state of 32-bits and a full period of 232. Ideal if you only want to seed with one 32-bit integer and don't care about the birthday problem. There is 4.3 billion possible states in Mulberry32 compared to the 340 undecillion in sfc32/xoshiro128**. As of May 2018, xoshiro128** is the new member of the Xorshift family. It offers a 128-bit state, and is super fast. This PRNG is the latest by Blackman/Vigna who also wrote the PRNGs xorshift128+ and xoroshiro that were used in Google Chrome back in 2015. It is notable as one of the few modern PRNGs with a 32-bit version. xoroshiro64** is also a promising option, but only has a 64-bit state and has largely been replaced by xoshiro. The authors claim it passes randomness tests well (albeit with caveats). Other researchers have pointed out that fails some tests in BigCrush (particularly LinearComp and BinaryRank). But it should not matter in practice, especially if the 32-bit value is converted to a float between 0-1 like these PRNGs are. However, it may cause an issue if you rely on the low-order bits. This is JSF or 'smallprng' by Bob Jenkins (2007), the guy who made ISAAC and SpookyHash. It performs well on PractRand tests and should be quite fast. The average period length is assumed to be 2^126 but 'hasn't been formally determined'. This version does not need a separate seed function. But as a result, only 32-bits can be seeded and this version pre-runs jsf() 20 times to disperse the initial state, which may be costly. If need be, the entire 128-bit state can be initialized directly and the for loop removed. I decided to keep the original construction because the author verified the cycle length of every possible 32-bit seed in the given configuration. This one is only here to provide a better alternative to options mentioned in other answers such as the Math.sin or Math.PI methods, which are less consistent or reliable across platforms. This LCG implementation is extremely fast but only has a 31-bit state and fails some statistical tests that previously mentioned generators pass with flying colors. It's a one-liner though—which is nice :). This is the minimal standard RNG as proposed by Park–Miller in 1988 & 1993 and implemented in C++11 as minstd_rand. Keep in mind that the state and period are only 31-bit (31 bits give 2 billion possible states, 32 bits give double that). This is the very type of PRNG that others are trying to replace. It'll work, but I wouldn't use it unless you really need speed and don't care about randomness quality (what is random anyway?) or the 31-bit state/period size. Great for a game jam or a demo or something. Also, LCGs suffer from seed correlations, so it is best to discard the first result of an LCG. There seems to be other multipliers that do offer a full 32-bit state. I have no clue if these are any better/worse statistically than the Park-Miller one, but here they are for completeness. These multipliers are from: P. L'Ecuyer: A table of Linear Congruential Generators of different sizes and good lattice structure, April 30 1997. Please see Pierre L'Ecuyer's work going back to the late 1980s and early 1990s. There are others as well. Creating a (pseudo) random number generator on your own, if you are not an expert, is pretty dangerous, because there is a high likelihood of either the results not being statistically random or in having a small period. Pierre (and others) have put together some good (pseudo) random number generators that are easy to implement. I use one of his LFSR generators. To write your own pseudo random generator is quite simple. The suggestion of Dave Scotese is useful but, as pointed out by others, it is not quite uniformly distributed. However, it is not because of the integer arguments of sin. It's simply because of the range of sin, which happens to be a one dimensional projection of a circle. If you would take the angle of the circle instead it would be uniform. So instead of sin(x) use arg(exp(i * x)) / (2 * PI). If you don't like the linear order, mix it a bit up with xor. The actual factor doesn't matter that much either. Please also note that you cannot use pseudo random sequences when real entropy is needed. I have written a function that returns a seeded random number, it uses Math.sin to have a long random number and uses the seed to pick numbers from that. it will return your seeded number the first parameter is any string value ; your seed. the second parameter is how many digits will return. For a number between 0 and 100. Is a function that calls Math.random() pure? How to create a 32-bit integer from eight (8) 4-bit integers?